Support Your Students. With Your Help, They Can Change The World. 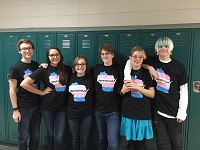 Members of the SAGA 6 (Dylan Carden, Karissa Red Bear, Claire Jenkins, Toby Louther, Emma Lookabaugh, and Liam Grahman) and their three adult sponsors (Amy Lyle, a community member, and Beth Maglio and Michael Sauer, teachers at Mt. Horeb High School) received an Honorable Mention for the 2017 NCTE National Intellectual Freedom Award. Yet other details of the story of how the Mt. Horeb community supported one of its younger citizens is told in this newscast, Mt. 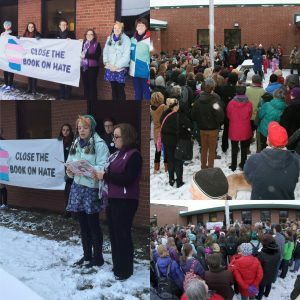 Horeb Library Hosts Reading of Book Removed From School Curriculum. Dylan Carden, Karissa Red Bear, and Claire Jenkins of the SAGA 6, Beth Maglio (teacher at Mount Horeb High School) and Amy Lyle (community member) came to NCTE St. Louis to accept the award. They were joined on the stage by NCTE President Jocelyn Chadwick. Here’s what they told us.